NEW DELHI: Looking to buy a new iPhone or even a car by trading in your old handset or 10-year-old hatchback? This kind of exchange could cost a bit more than just depreciation when the proposed goods and services tax (GST) is rolled out. The draft GST law proposes to bring barters, exchanges and licences under its purview. The levy is set to be implemented from April 1 next year,assuming that the government and the Opposition can reach a consensus that will pave the way for the necessary legislative approvals. 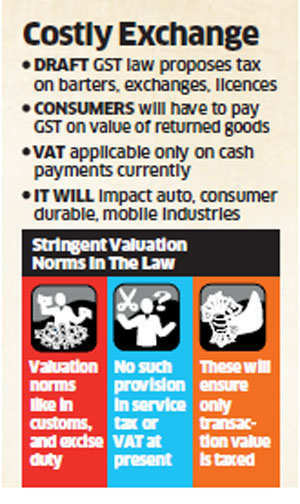 But “valuation of goods and services will be a challenge and clear guidelines are required to mitigate any disputes,” said Bipin Sapra, partner, EY. “The concept of barter which exists in certain state laws and service tax has been introduced in GST.